Early one morning last December, Maria Siemionow got the kind of call she had been expecting for 20 years: A potential organ donor had been found for 46-year-old Connie Culp, whose 30 surgeries hadn’t repaired the trauma to her face from a gunshot wound she’d suffered in 2004. 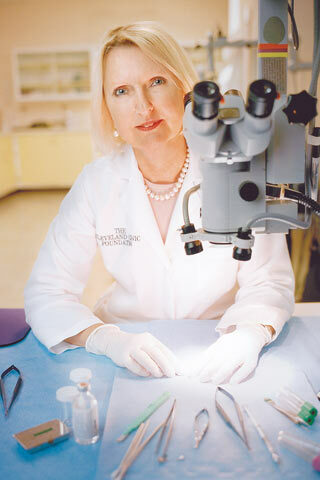 The match between the donor and Culp was confirmed, and at eight o’clock that night, Siemionow, director of plastic surgery research and head of microsurgery training at the Cleveland Clinic, and other surgeons began removing the facial tissue, arteries, veins, nerves, soft tissue and bony structures of the donor’s face. Meanwhile, in an adjacent operating room, a second surgical team began removing scar tissue from Culp’s face so she could receive the graft. At 5:10 the following morning, Siemionow’s team began attaching the graft, arteries, veins and nerves. The 22-hour procedure replaced 80% of Culp’s face (she had been missing her nose, right eye, lower eyelids, upper lip, upper jawbones and palate). When my story about face transplants appeared in Proto (“Saving Faces,” Winter 2006), the Cleveland Clinic was the only medical institution willing to stake that a full-face transplant was both possible and ethical. As Siemionow waited for the right patient, surgeons in France and China made headlines with the first three partial transplants. Since then, French surgeon Laurent Lantieri, who performed a partial face transplant in 2005, has done two more, in March and April of this year. And on April 9, a medical and surgical team of 35, led by plastic surgeon Bohdan Pomahac at Brigham and Women’s Hospital in Boston, performed the second face transplant in the United States, grafting a nose, hard palate and upper lip to a man with facial injuries caused by an accident. But according to Siemionow, her near-total face transplant remains the most extensive single procedure to date. Though surgeons are poised for more cases, the need for toxic immunosuppressant drugs is one of the major hurdles keeping facial transplantation from expanding beyond the most extreme cases of disfigurement. To prevent their bodies from rejecting the foreign tissues, recipients must take potent drugs that can cause life-threatening infections, diabetes, and kidney and liver failure, and shorten life expectancy by 10 to 15 years. The drug regimen for a new face is especially complex because the graft includes several types of tissue, each of which stimulates a different immune response. Rather than suppress the entire immune system, many laboratories, including Siemionow’s, are seeking ways to limit the recipient’s immune response. This year Siemionow hopes to test on kidney transplant patients an antibody that’s designed to suppress the response to only certain kinds of tissue and therefore cause fewer side effects.